So, what are the prominent reasons that might be causing this problem? There are several factors that can cause this BSOD error to show up unexpectedly. Corrupt or Old device drivers, corrupt Windows Registry keys or sub-keys, bad system files, corrupted RAM, faulty hard drive, malware, and faulty hardware are some of the very common reasons. In this exhaustive article, we try to provide you all the possible ways to fix DRIVER_VERIFIER_DETECTED_VIOLATION Windows 10 error. Try each one of them till you find a fix to the problem. Step 1: Open Device Manager on your PC. To do so, press Windows + X keys together, which will open Win + X menu. From there, click on Device Manager. Step 2: Look for Display adapters option in Device Manager. Expand Display adapters to locate your graphics card driver; it could be NVIDIA, AMD, or Intel, depending upon the graphics card on your PC. Right-click on it, then select the Update driver option. Step 3: In the new window that opens, select the Search automatically for updated driver software option. Your PC will automatically start looking for an update of your graphics driver and install it, if available. After successful graphics driver update, restart your computer and check if the DRIVER_VERIFIER_DETECTED_VIOLATION error continues to occur. If so, skip to Method #2. If your graphics driver is already updated to the latest version, you will be informed about that. In that case, look at Step 4, where you will have to reinstall your graphics driver. 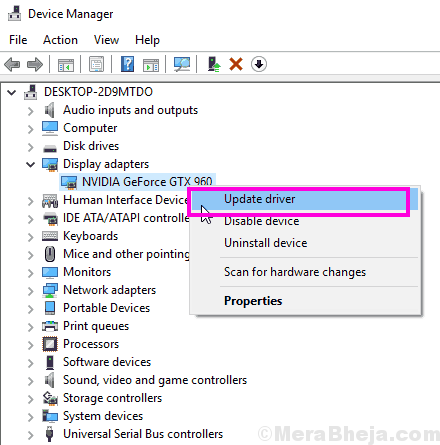 Step 4: Right-click on the NVIDIA Graphics Card driver, as shown in Step 1 & 2 above, and click on the Uninstall device option. Step 5: When the Graphics driver is uninstalled, visit the website of your Graphics Card manufacturer. You will get the options to download the latest driver according to your PC’s configuration. When you have downloaded the driver, install it on your PC. You can simply run the downloaded driver file. 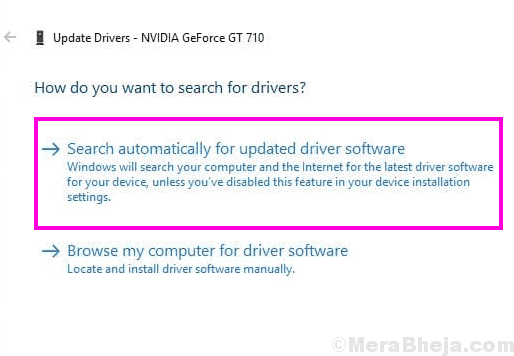 Or, follow the steps as mentioned till Step 3 above, but instead of selecting the Search automatically for updated driver software option, select the Browse my computer for driver software. Then browse and locate the downloaded driver file, and proceed with its installation. When the installation of your new graphics card driver is complete, restart your PC, and see if the DRIVER_VERIFIER_DETECTED_VIOLATION error still continues to bug you. If so, try Method #2. Step 1: On your keyboard, press Windows + X keys at a time. 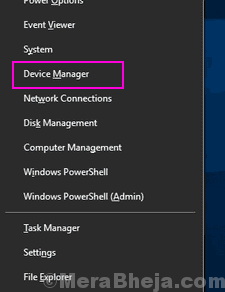 From the opened Win+X menu, click on the Device Manager option. Step 2: From the list, click on Display Adapters option to expand it. Now, right click on your Graphics Card Driver, and click on Properties option from the right-click menu. Step 3: This will open the Properties window. There, in the Driver tab, click on the Roll Back Driver option. 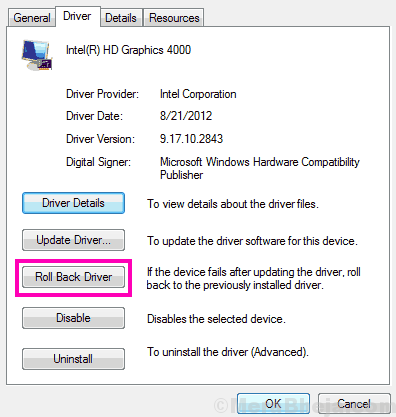 Following the on-screen instructions will roll back your current graphics card driver to its previous version. Rolling back graphics card driver didn’t fix DRIVER_VERIFIER_DETECTED_VIOLATION Windows 10 error? Trying the next step will most probably solve the issue. Step 1: Open Device Manager on your PC. To do so, press the Windows + X keys together on your keyboard, and from the Windows + X menu, select the Device Manager option. Step 2: Starting from the first device driver in Device Manager, right click on the driver, then click on the Update Driver Software option from the right-click menu. Step 3: From the new update window that appears, select the Search automatically for updated driver software option. 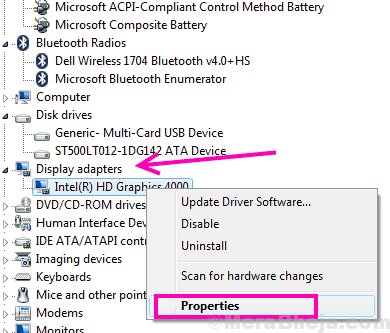 Your PC will begin looking for new version of the already installed drivers on your computer and if found, the new driver version will be installed. If you get the message that you have the latest driver installed, give the next driver a try for an update. Keep doing the same for all the drivers in Device Manager. Once, you have updated all the outdated device drivers with the new ones, restart your computer and check if you are still getting the same DRIVER_VERIFIER_DETECTED_VIOLATION error. If yes, then your problem wasn’t solved, give the next method a try. Many users have reported that underclocking their Graphics Card did the trick for them. To get better graphics performance, users often overclock their graphics card. If you use a graphics card, try to underclock its performance by around 100MHz and see if you still get this BSOD error. You can underclock your graphics card from its control panel, which you can usually find in your desktop right-click menu, or in the system tray at the far right end of the Taskbar. Underclocking your graphics card may reduce the graphics performance on your PC, but that probably would be the best option with respect to your PC configuration. 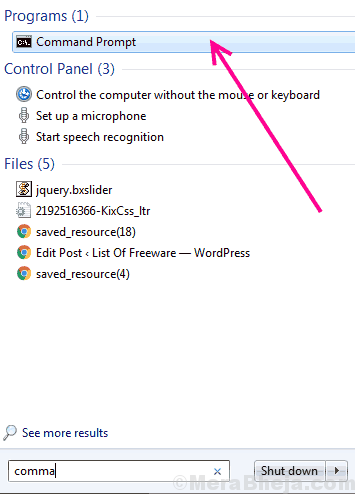 Step 1: Go to Start menu, and in the Start search bar, type cmd. The Command Prompt option will appear as the search result. 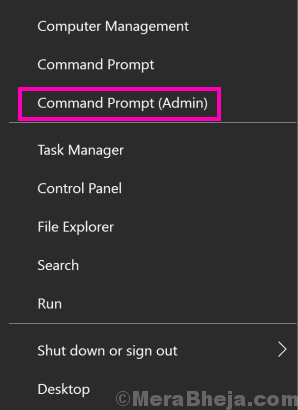 Right-click on the Command Prompt option, then click on the Run as administrator option from the right-click menu. This will open CMD in administrator mode. Step 2: In the Command Prompt window, simply type verifier and press Enter button to open Driver Verifier. 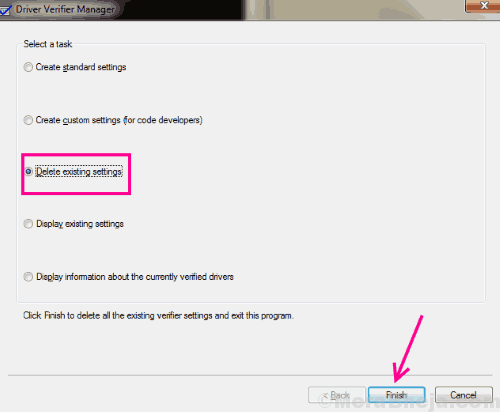 Step 3: In the Driver Verifier window that opens, you will get to select a task to perform. Select the Delete existing settings radio button, then click on the Finish option. Restart your computer and check if the Driver Verifier error reoccurs. If yes, proceed to Step 4 to reset the Driver Verifier. 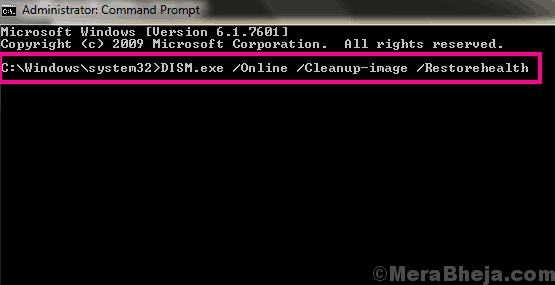 Step 4: Open Command Prompt according to the instructions in Step 1. 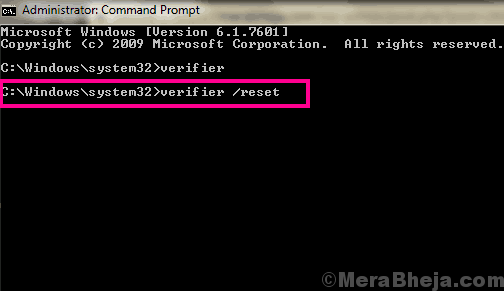 Step 5: Type verifier/reset in command prompt and press the Enter button. When this is done, restart your computer. Step 1: Open Command Prompt in Administrator mode. For this, open the Start menu and in the Start search bar, type cmd. From the search result, right click on the Command Prompt option. 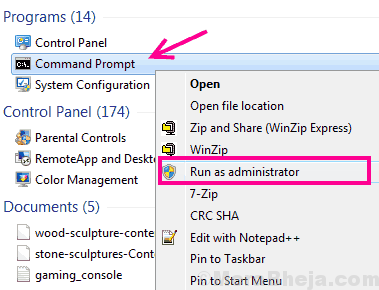 From the right-click menu, select the Run as administrator option to open Command Prompt in administrator mode. Step 2: In the Command Prompt window, you have to type: sfc /scannow then press the Enter key. The SFC scan takes a bit of time to run, which is around 15 minutes. Wait for the scan to finish. Make sure that you do not interrupt the SFC scan. When the scan completes, restart your computer. Then, see if the Driver Verifier Violation error still continues to come up. If this doesn’t solve the problem, give the next method a try. Step 1: Follow the directions mentioned in Step 1 of Method #6 to open Command Prompt in Administrator mode. After that, press the Enter button to run the scan. Wait till the scan is complete. Now press Enter to run this scan as well. Once the DISM scan is complete, restart your computer. After that, check if the error shows up again. If it does, try next method. This method is for those users who use any virtualization software on their PC. Virtualization software, such as VMware or VirtualBox have been linked to DRIVER_VERIFIER_DETECTED_VIOLATION BSOD error. So, if you use a virtualization software, try to uninstall it and see if you still get the error. If the error goes away with the software, you can try to install the latest version of the virtualization software you just uninstalled. Step 1: Open the Start menu on your PC, and in the Start search bar, type Command Prompt. After you have finished typing, press Ctrl + Shift + Enter keys together. You will be asked for a permission to run Command Prompt through a dialog box; press Yes. This will open Command Prompt in Administrator mode. This will initiate the Check Disk scan to look for errors on your Hard Drive. If any error is found, the program will try to fix the error. Note: Do not interrupt the Check Disk scan while it’s still running. It may take some time to finish. Once the scan is complete, restart your PC and see if this scan fixed your error. If not, we will try to test your RAM for errors. Step 1: Press Windows + X buttons on your PC at a time. From the Windows + X menu that will open, select the Command Prompt (admin) option. This opens the Command Prompt in Administrator mode. 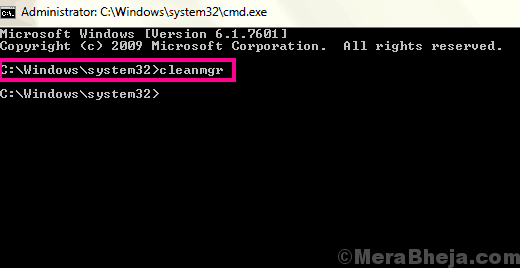 Step 2: In Command Prompt, type cleanmgr and hit the Enter key. This will run the Disk Cleanup tool. Step 3: When the tool opens, select the drive where Windows is installed. It is generally the C drive, and the drive has a Windows logo with it. 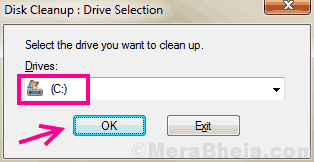 After selecting the drive, press Ok. Step 4: A scan will run to detect all the unnecessary junk files on your PC. Step 5: When the scan is complete, you will get a list of all the unnecessary junk on the C drive of your PC. 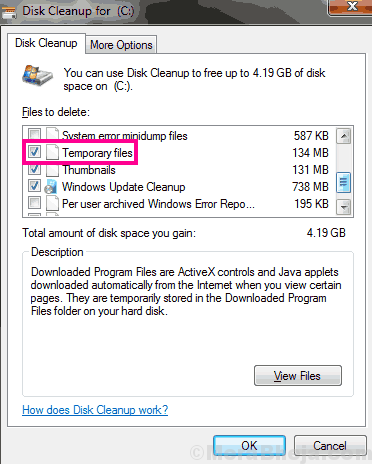 Select the Temporary Files from the list along with other junk you would like to remove. After selecting the files to delete, press the OK button. Depending on the size of junk you are deleting, Disk Cleanup will take some time to delete them. Check out if this method did fix DRIVER_VERIFIER_DETECTED_VIOLATION error or not. Step 1: Open the Start menu; there, type Settings. From the search list, click on the Settings option. Step 2: In the Settings window, select the Update and Security option as shown below. Step 3: The Update & Security window will open. In this window, go to the Windows Update section. Here, click on the Check For Updates option. This action will begin looking for new Windows updates, updated drivers, and more. Follow the on-screen instructions, and complete the Windows 10 update. Once the Windows 10 update completes, your computer will be restarted. Check if the error continues to show up. Viruses or Malware might be the reason you are facing the DRIVER_VERIFIER_DETECTED_VIOLATION error on Windows 10 time and again. If you do not have an Antivirus or Antimalware installed on your PC, install one and run a scan. If you already have an Antivirus or Antimalware installed and it couldn’t detect any issue, try a new one and run a scan on your PC. Remove the virus or malware as soon as you find one. Restart your PC and look out for the error. Step 1: Find the This PC option on your Desktop. Right-click the icon, then select Properties option from the right-click menu. 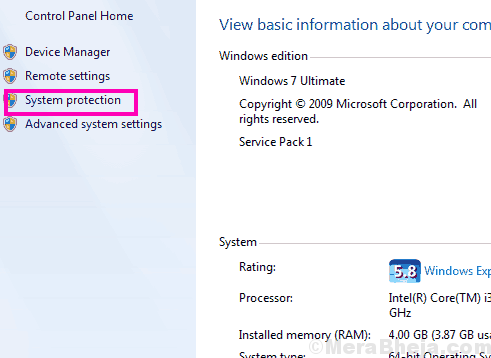 Step 2: The System Protection window will open up; select the System Protection option on the left panel of the window. Step 3: In the new window that opens, select the System Restore button. 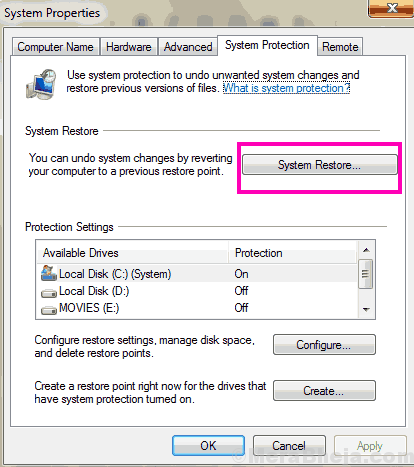 Here, you will have to choose the restore point where you can roll back your PC to. Just confirm that you select a restore point dating before you began getting DRIVER VERIFIER DETECTED VIOLATION Windows 10 error. Begin with the system restore and wait until the process is complete. Important: Carrying out a System Restore will clean all the data on your PC which you saved after the restore point date. 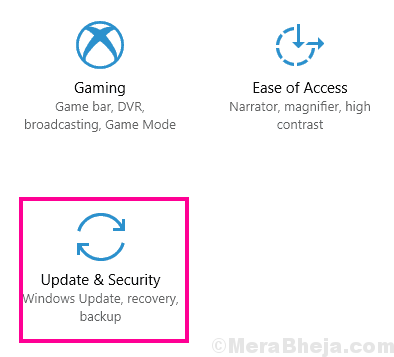 It is recommended to take a backup of important files on an external drive before begin system restore. Step 1: Press the Start button and type Settings. Click on the Settings option from the search result list. Step 2: A new window will open. There, click on the Update & security option. 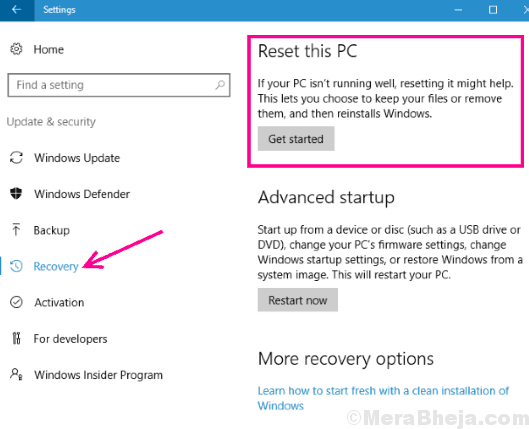 Step 3: Here, select the Recovery option from the left panel, then in the Reset this PC section, click on Get Started button. Here on, follow the on-screen instructions to reset your Windows. This will for sure, solve the DRIVER VERIFIER DETECTED VIOLATION error in Windows 10. I would close this article by saying that, if you haven’t tried these methods to fix the Driver Verifier error yet, then do not worry. The first few steps will solve the problem for you 80% of the time. 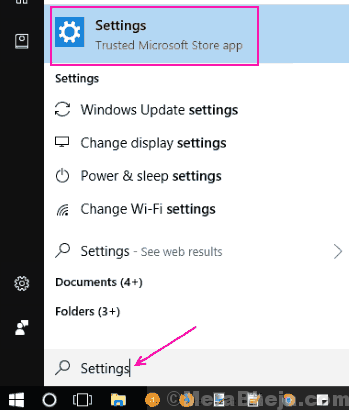 Only if your PC has some serious issues, you will need to scroll down while trying these methods to fix DRIVER_VERIFIER_DETECTED_VIOLATION Windows 10 error.